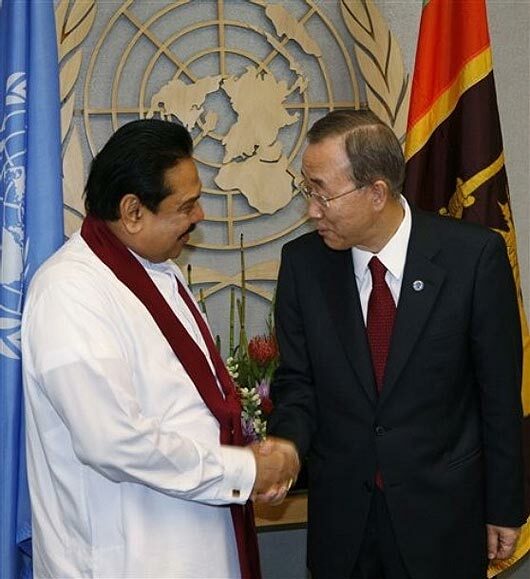 President Mahinda Rajapaksa who is New York attending the UNGA summit called on UN Secretary General Ban Ki moon in New York and held one on one talks at UN office Presidential sources said. President during his address in UNGA had apprised the world leaders of the latest post conflict situation in Sri Lanka and said that as he mentioned in his address to UNGA Sri Lanka has accorded highest priority on building a lasting peace, healing wounds, ensuring economic prosperity and guaranteeing the rights of the whole nation to live in harmony. President and Mr Ban also exchanged views on the UN SG Committee on Sri Lanka and President said that he has established Lesson Learnt Reconciliation Commission in expression of principles of Accountability and the Commission has already submitted to him some proposals to be implemented in the administrative process in the country. It is well and good for HE the President MR to hold talks with UNSG Ban Ki-Moon face to face and aprise him, of the truth of the last days of War of Liberation when the kotiyas were totally vanquished, and also our efforts to brings about peace and reconcilliation among all communities with our own home-grown solutions instead of ‘solutions’ imposed on us by the imperial West to favour the kotiyas, the nationalist extremists. 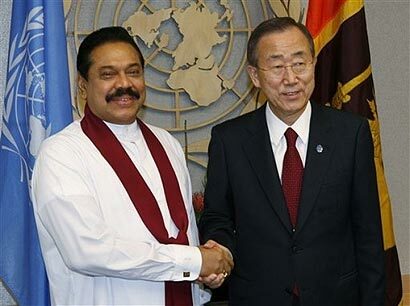 UNSG appointed the Committee on Sri Lanka at the prompting of USA, Britain, Norway and the UN Human Rights Commissioner Navi Pillai, who is a South African born Tamil, who is biased in favour of the paradesi kotiyas. The members of this committee were also handpicked by NP and are biased against MR Government. MR should never give in to pressure from the imperial West and the UNSG to allow this Committee to carry out their biased investigation to submit a report to UNSG. MR should stick to his guns to protect our heroes from false allegations by the JVP led SF, the great traitor, and this UNSG Committee. MR appeared to be too friendly with Nowway’s PM and the sly dog, Eric Solheim, when he met them at the UN. It is one thing to get their aid through INGO NORAD, but another thing to allow Norway to appoint also their own committee to carry out a 6 month investigation on the final days of the war. Under the pretext it is to investigate the reasons why the peace treaty failed, Norway who sponsored and supported financially and militarily the LTTE to wrest control by armed insurrection one-third of our country to create an autonomous state for the so-called Tamil nation, has a hidden agenda. Norway’s real objective is to gather evidence of human rights abuse and war crimes against the government and the defence forces. We should never allow this. Norway is a crafty dog. Norway is our enemy. MR should be infact demanding from Norway billions of dollars in compensation for 30 years of LTTE destruction aided by Norway. Hon President, please do not sleep with this evil, visagora sarpaya. The imperial West is already plotting your assassination to put SF on the throne, like Saddam Hussein. I am a Tamil and I agree with half of what’s been said by N Dias. In the first matter, why fear the UN Panel if no war crimes were committed as claimed by the President? If the war was fought with a gun in one hand and the Human Rights Manual in the other hand, GOSL should welcome UNSG’s Panel to clear its name. In the second matter, I do agree with N Dias that the Norwegians are snakes. They failed in their mission to bring about peace between the LTTE and GOSL. They shared all the information they had about the LTTE and the GOSL with all their western associates, possibly including the CIA. Now they are urging the Tamils to embrace recocilliation through the parliamentary and/or democratic process. It is difficult to trust these guys because of their ulterior motives. The GOSL has a valid claim for compensation arising from the Norwegians’ failure which resulted in prlonged suffering of the Citizens of Sri Lanka. As facilitators, they claimed to be unbiassed but failed to demonstrate that quality. It is best these guys are kept away form the internal affairs of Sri Lanka. Well said Demala Chelvan! Norway is our enemy with a hidden agenda. They are once again trying to crawl back to play dirty politics in favour of carrying out the objectives of US imperialists for SE Asia and the pardesi kotiyas. Norway is a deadly vicious snake. Norway is trying to worm its way to MR good books by an indirect bribe of NORAD help to devlop Hambantota. Would MR fall for such tricks? Let MR accept their aid but keep Norway out from playing dirty politics and subversion of our economic progress after 30 years of devastation Let MR demand from Norway to cough-up billions of dollars in compensation for 30 years of economic devastation and suffering the whole nation suffered. MR should not welcome a special committee from Norway for a so-called 6 month investigation into why their peace treaty signed by the traitor Ranil failed. We do not need their so-called investigation. I will tell why their peace treaty failed. 1. It was cunnignly and secretly devised by the LTTE and Norway together in favour of LTTE gaining autonomy. 2. LTTE was free to grow in strength militarily by duty free import military equipment in ship loads. 3. They were free to encroach on more territory of the Sri Lankan nation while the SL security forces were tied down by the peace treaty not to resist such incursions. 4. LTTE were free to kidnap Tamil children to train as insurgents and for suicide missions. 5. They were free to impose heavy taxes on all vehicles passing through their stretch of A9, so that the costs of goods in the North were unbearably high for the Tamil people in the North. 6. There were thousands of serious breaches of the treaty by the LTTE which the so-called Norwegian Monitoring Mission merely recorded with no sanctions against the LTTE, so that the Peace Treaty became lop-sided. 7. Norway and the imperial West began to treat LTTE held region as a separate autonomous country with whom they began diplomatic relations independant of the GOSL. 8. The Security Forces of SL were relegated to stay in their barracks and not allowed to grow militarily strong. 9. Former Defence Secretary and the PM were traitors who were corrupt as they were in the pockets of the LTTE and Norway and conceded their demands. 10. The so-called Peace Treaty was not debated and sanctioned by Parliament and by the President CBK. No details were revealed in the media. It was imposed on the country in an underhand manner by the traitor, Ranil, according to the will of the LTTE leader. Thank you for you commiserations on my comment. Unfortunate that you have opted to my comments on the “first matter”. Thank you for you commiserations on my comment. Unfortunate that you have opted to ignore my comments on the “first matter”. UNSG is very biased, and manipulated by USA, Britain, Norway and diaspora LTTE to bring charges of human rights abuse and war crimes against our heroic forces who defended and liberated the nation of the terrorist LTTE. They initiated the process by a so-called UNSG Panel to investigate and report to the UNSG. During the 30 years of most brutal terrorism unleashed by the LTTE the UNSG and the imperial West was deafeningly silent. There was no call for human rights abuse, war crimes, crimes against humanity, conscription of children by the LTTE to become gun fodder. NO UN army was raised to march against the LTTE and destroy them. Norway in particular treated the LTTE as ‘separatists’ fighting a just war for autonomy. Norway and the imperial West had vested interests in turning a blind eye to the atrocities of the LTTE, and directly and indirectly supporting them. Navi Pillai, a South African born Tamil is also biased against GOSL. The ‘white flag’ cannard was fabricated by JVP, SF and the diaspora LTTE leaders to embarrass the GOSL. The imperial West and Norway are using it as a means of taking revenge for the total vanquishing of LTTE and its leaders. The real human rights abusers are Britain and USA even to this day. Isn’t it strange that UNSG is keeping mum about it? Where is the UNSG panel to investigate and report to the UNSG, blatant war crimes and human rights abuse in IRAQ and Afghanistan? So, Demala Chelvan, the point I am making is no self-respecting government should ever allow UNSG panel to set foot on our dear land to carry out bogus investigations. Let the UNSG panel be first appointed to investigate charges of war crimes, crimes against humanity, and human rights abuse of Britain and USA. Let these hypocrites be brought to The Hague first to answer for their evil crimes through 60 years of wars around the globe.